This is the first detection of SPB in New York State. Long Island, NY - October 29, 2014 - The New York State Department of Environmental Conservation (DEC), in cooperation with the United States Forest Service, the United States Fish and Wildlife Service, the New York State Office of Parks, Recreation and Historic Preservation, and the Central Pine Barrens Commission, today confirmed the presence of southern pine beetle (SPB) in three locations along the southern shore of Long Island. Personnel from each agency worked together to verify the presence of this destructive beetle after the discovery of dead and dying pine trees in portions of the Wertheim National Wildlife Refuge, Connetquot River State Park and the Henry's Hollow Pine Barrens State Forest. This is the first detection of SPB in New York State. "The Long Island Pine Barrens is a unique and precious natural resource which provides critical environmental, social, recreational and economic benefits to Long Island residents and communities," said DEC Commissioner Joe Martens. "Its signature pitch pine resource is seriously threatened by this newly discovered, non-native insect. We are hopeful we have discovered this insect's presence at an early stage and are committed to working with local, State and Federal partners to determine the extent of the infestation and minimize its spread and impacts." State Parks Commissioner Rose Harvey said, "I encourage park visitors to familiarize themselves with the signs of Southern Pine Beetle, and report anything they see. The public's awareness and cooperation are among the most effective ways to slow the spread of destructive species." The SPB, a bark beetle native to the southern United States, has steadily expanded its range north and westward, possibly due to climate change. Considered one of the most destructive forest pests in the United States, SPB attacks all species of pine including pitch pine, the predominant species found in the Pine Barrens. An estimated 1000 new acres of pine forests in New Jersey have been destroyed each year by SPB since it was found in that state in 2001. Minimizing the damage to the over 100,000 acres of pine habitat on Long Island is paramount in determining the management activities employed to combat the beetle. Adults bore into the bark until they reach the cambium layer. There the female creates S-shaped tunnels through the living tissue along which she lays her eggs. After the eggs hatch, the larvae will feed out from these tunnels eventually reaching the outer bark where they pupate and emerge as adults through small, round holes that often create a shotgun pattern on the bark. Most trees die quickly, often succumbing within 2-4 months, due to girdling from tunnel construction. Aerial surveys will be conducted in the coming weeks to pinpoint areas of concern and suspicious looking damage will be investigated by field staff to determine the extent of the infestations. Existing management plans for SPB will be reviewed to determine if those strategies may be applicable in New York State. Research in New Jersey has shown that SPB in the north east will most likely overwinter in the pupal stage, making the coming winter season a window of opportunity to analyze the situation and devise a strategy to combat it. Central Pine Barrens Commission Executive Director John Pavacic stated, "The Central Pine Barrens is of regional significance as it lies over a Federally-designated sole-source aquifer which provides the only supply of potable drinking water for many of the nearly two million residents of Suffolk County. In addition, this important ecosystem contains one of the highest concentrations of rare, endangered and threatened animal and plant species in all of New York State, some of which are found only on Long Island. Continued protection, preservation and management of these natural resources therefore remains a major priority." "We're certainly concerned about having the southern pine beetle on our wildlife refuge and in the heart of Long Island's pine barrens," said Michelle Potter, manager of the U.S. Fish and Wildlife Service's Long Island National Wildlife Refuge Complex. "But we are also committed to working closely with the New York Department of Environmental Conservation and NY Extension, the U.S. Forest Service, Dartmouth College researchers and the public to understand the scope of this challenge and respond in an effective and comprehensive manner." 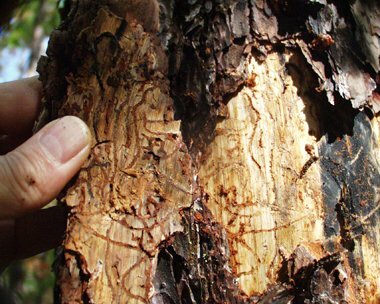 "Southern pine beetle presence in New York is new, but not totally unexpected," says Kevin Dodds, U.S. Forest Service Entomologist. "Fortunately there are tools available to help manage beetle populations if we find that the insect is widespread and causing tree mortality." SPB photos and maps related to the recent areas of discovery are available on DEC's website. Subject: LongIsland.com - Your Name sent you Article details of "Southern Pine Beetle Confirmed for the First Time in New York State"